Everyone can benefit from building stronger muscles, and that includes people who want to lose weight or who do cardio exercise regularly. “If you’re really looking to get healthier, you need to add strength training to your walking or running workout,” says Dwayne Wimmer, personal trainer and owner of Vertex Fitness in Bryn Mawr. Do strengthening exercises 2 to 4 days a week. You can add these body-weight moves to your walking or running workout, or do them on their own for a quick toning session. Stand with hands on hips and feet together. Step forward with your right foot, and lower hips until right thigh is parallel with ground. Pause, then straighten right leg to push back up to standing. That’s 1 rep. Aim for 10 reps on each side. Place hands shoulder-width apart on the second step of stairs. You can balance on the balls of your feet or on your knees, if easier. Bend your arms, and lower body toward ground, keeping elbows by sides. Pause, then straighten arms to push back up to starting position. That’s 1 rep. Aim for 5 reps. No stairs? 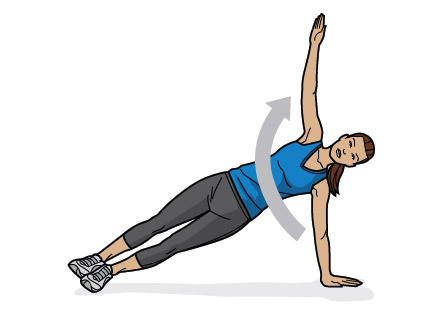 Do regular push-ups on the ground. Stand with arms in front of you and feet hip-width apart. 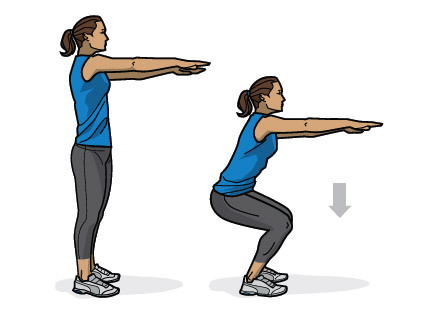 Keeping back straight, bend your knees, and lower hips as if you were sitting into a chair. Make sure knees do not extend past toes. 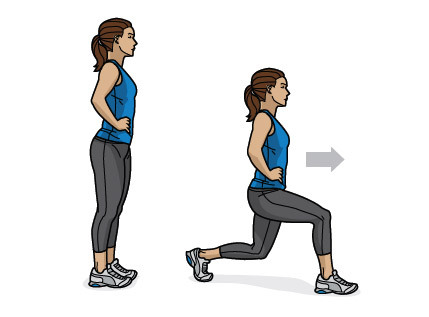 Pause, then straighten legs to push back up to standing. That’s 1 rep. Aim for 10 reps. Sit on the edge of a bench or sturdy chair. Place palms on the bench next to your thighs. Keeping arms straight, scoot forward until your rear is off the bench. Your legs can be straight or bent, if easier. Bend your arms, and lower hips toward ground. Pause, then straighten arms to push back up to starting position. That’s 1 rep. 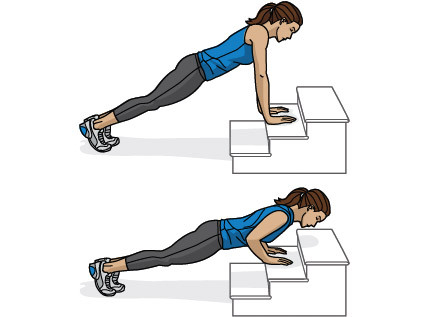 Aim for 10 reps.
Balance on hands and feet with arms and legs straight, as if you were starting a push-up. Rotate to the right side, balancing on your left arm, lifting right arm toward ceiling, and stacking right leg over left leg. Hold the move for 5 seconds, keeping abs tight and back straight. Don’t forget to breathe. That’s 1 rep. Aim for 5 reps on each side.